Animal Wildlife | Macaroni Penguin | The macaroni penguin is a large-sized species of penguin found in the Sub-Antarctic regions. the macaroni penguin is one of six species of crested penguins is so closely related to the royal penguin, that some people class the two as the same species. The macaroni penguin spends most of its time during the colder winter months fishing in the cold oceans where the macaroni penguin is more protected from the bitter conditions of the Antarctic winter on the land. However, when the summer is approaching and temperatures at the South Pole increase, the macaroni penguin makes it way to land in order to breed. Like other penguin species, the macaroni penguin is a carnivorous animal as the only source of food is in the surrounding water. The macaroni penguin spends six months during the cold winter months hunting fish, squid, krill and crustaceans which the macaroni penguin catches in its long beak. The macaroni penguin only has a couple of natural predators in the freezing Antarctic Ocean as there are only a number of animal species that can survive there. 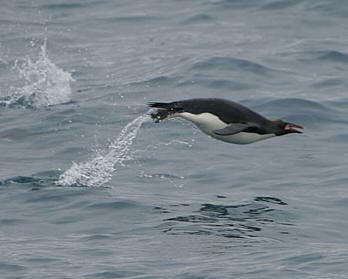 Leopard seals, killer whales and the occasional passing shark are the only real predators of the macaroni penguin. 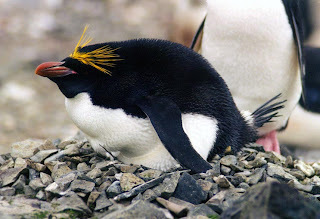 The macaroni penguin returns to the land during the warmer summer months in order to breed. 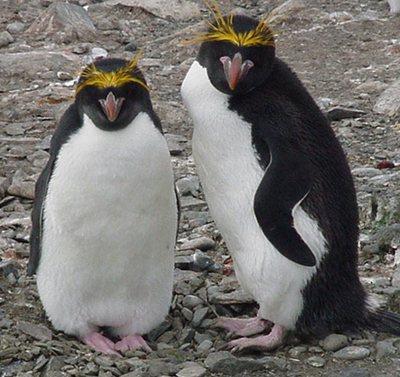 Macaroni penguins gather in large colonies which can contain up to 100,000 individuals in order to lay their eggs. Female macaroni penguins generally lay two eggs a couple of days apart that hatch after about six weeks. 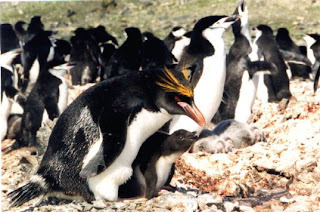 Both the male and female macaroni penguin parents help to incubate the eggs and raise the chicks. 0 Response to "Macaroni Penguin"